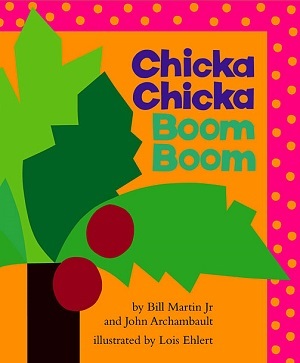 Chicka Chicka Boom Boom is an all time favorite book in schools and preschool is no exception! 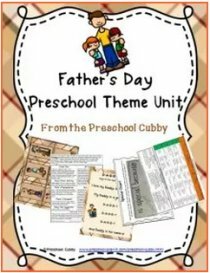 Find preschool lesson plans and activities for this theme for your preschool classroom! Let the Chicka Chicka Boom Boom Theme planning begin! 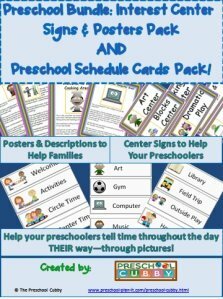 You can either scroll down through this page to see all of the preschool activities for your theme or click the link below to go to specific preschool lesson plans or activity types you are looking for. Just let the children cut the different shades of brown paper into pieces and glue onto larger paper to make a tree trunk. Let them do the same with different shades of green for the leaves of the tree. 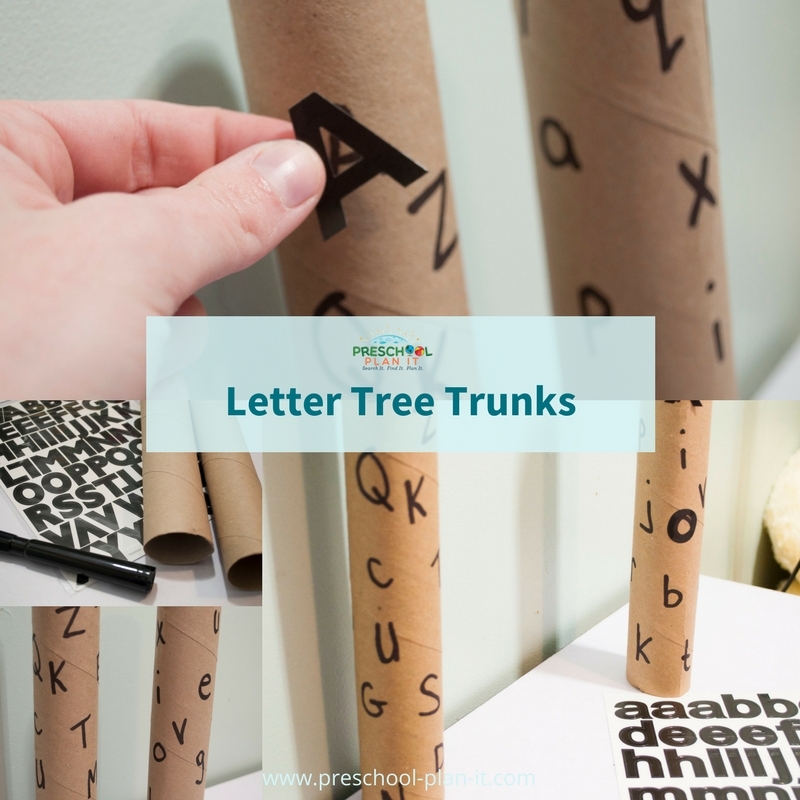 Help the children find the letters for their name and glue them on the tree (provide a name card with each of the students' name printed so they can try and find the letters themselves!). VARIATION: Pre-cut the paper into the shape you are working on with your preschoolers. They can make their tree out of circle shaped brown and circle shaped green. You might also want to let your children who are able cut them into shapes. In advance, cut out a HUGE coconut tree! Provide squares of paper, chalk and 26 or more if you have them--toy cars. Tape a letter on top of each car. The children print the letter on a square of paper with chalk. They park the cars on the correct letters. 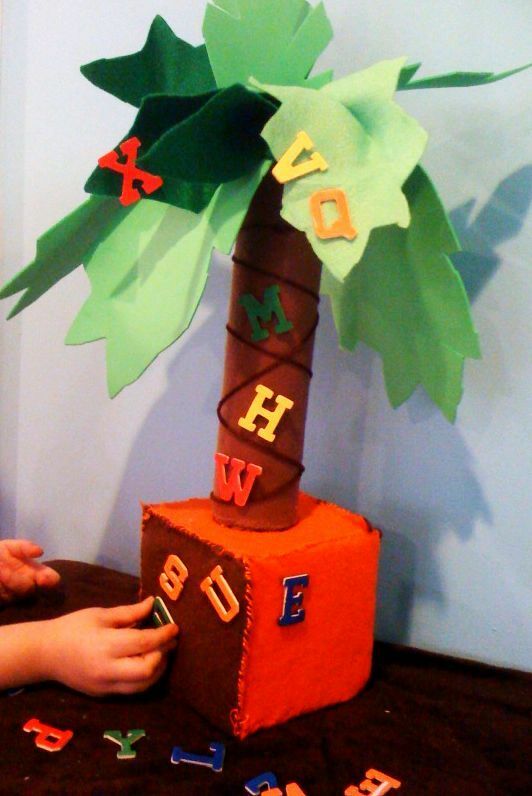 Make (or purchase) a tree, letters and coconuts. Give each child a letter to hold while you read the story. They come up and place it on the tree as you as the letters! I saw the above picture on Pinterest and LOVED it! This would be a great addition to your library area as well as a 3D way to read the story at Circle Time! "It’s just felt, glued and wrapped around a cardboard tube stuffed down in a tissue box (which also is covered in glued-on felt). I think I might have stitched around the bottom to hold it all together. The letters have tiny stick-on Velcro pieces to attach to the tree. The leaves are craft foam, stuck down into the cardboard tube and glued in"
Snack Recipe Ideas to Cook Up for Your Chicka Chicka Boom Boom Theme! Cooking with children helps develop their math skills and helps them to learn how to follow directions. It also allows for some great conversation! Ask many questions while cooking with your children to encourage conversation! Be sure to ask specific themed questions while making these fun snacks! Alphabet cookies for the letters. The children cut their cheese or bread with a letter cookie cutter! Provide a table for children to make and decorate paper letters. They can then "sell" their letters in the Letter Store. Provide a cash register, shopping carts, bags, etc. Chicka Chicka Boom Boom Tree Thanks, Patty, for this idea! I asked Lowe's for a carpet tube to make a tree. We used it for a rainforest, palm tree for Hawaii and now are using it as our Chicka Chicka Boom Boom tree. I purchased a lime gree umbrella at Five Below. The handle of the umbrella fit perfectly into the tube. Then I cut and taped tissue paper fonds onto the umbrella. It is perfect for the kids to sit under and also comes apart easily to store. Trace the first letter of each child's name onto easel paper. Allow them to paint or use do-a-dots to decorate. When dry, they place the letter on the tree. Be sure to have them print their first name on the letter as best they can. Practice is great! Provide large letters (foam ones from puzzles work great) and boxes or bins. Place all the letters on the floor in front of the children playing. The reach down, pick up a letter and name it. They then toss it into a bin. Cover any sharp edges of the can with tape. Cover the outside of the can with brown paper to look like the trunk of a tree! Place the magnetic letters inside the can. Place this can in the library area with a copy of the book of course! See the suggestion above in the Circle Time area for a picture of this! It would be a great addition to your library! Alexandra F. says she will add an inflatable coconut tree pool for the children to read in! I love it! Thanks for sharing Alexandra! I found one of these inflatable coconut trees at Amazon . It would be GREAT for the library area! Chicka Chicka Boom Boom Theme Activities to help your Preschoolers develop those small muscles in their hands and develop their math skills! In advance, print or draw Chicka Tree shapes. Color the leaves different colors. Make 2 of each color. Laminate. The children can use these to match the colors. They can also be used as a memory type game by flipping them all face down. The child flips over two. If they match, they put them aside. If they don't, they flip them back over and flip two more over. Trace the stones on the poster board. Cut out circle shapes from the poster board. You will need one for each letter for each set you want to make! Print a letter on each circle. Hot glue the letter circles onto the bottom of the clear stones (so you can see the letter through the stones). When dry, use tacky glue to glue circle magnets onto the back of the poster board. Draw and attached a Chicka Tree to a cookie sheet. The children retell the story using the letters! 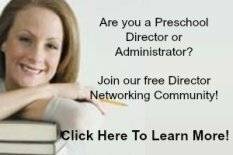 Chicka Chicka Boom Boom Theme Music and Movement Activities and Ideas to get your Preschoolers Movin' and Groovin'! Once the children are familiar with this story, try a movement version of telling it! The children stand up and next to a partner or two. Every time you say Chicka Chicka, you will pause and they will clap twice. Eventually, encourage them to clap WHILE you say it. Every time you say Boom Boom, they will bump hips with a partner! 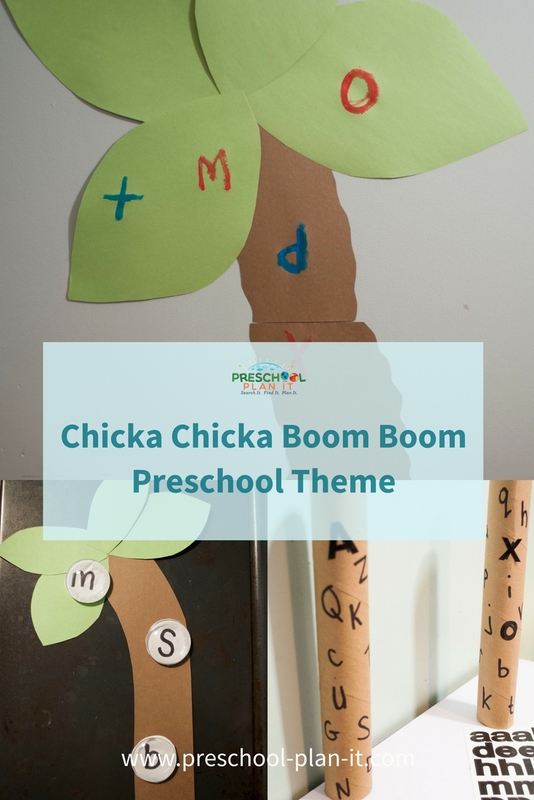 Chicka Chicka Boom Boom Theme Activities for the Senses! Provide sand at your table. Add plastic trees, shoves and plastic or foam letters (hide them in the sand). 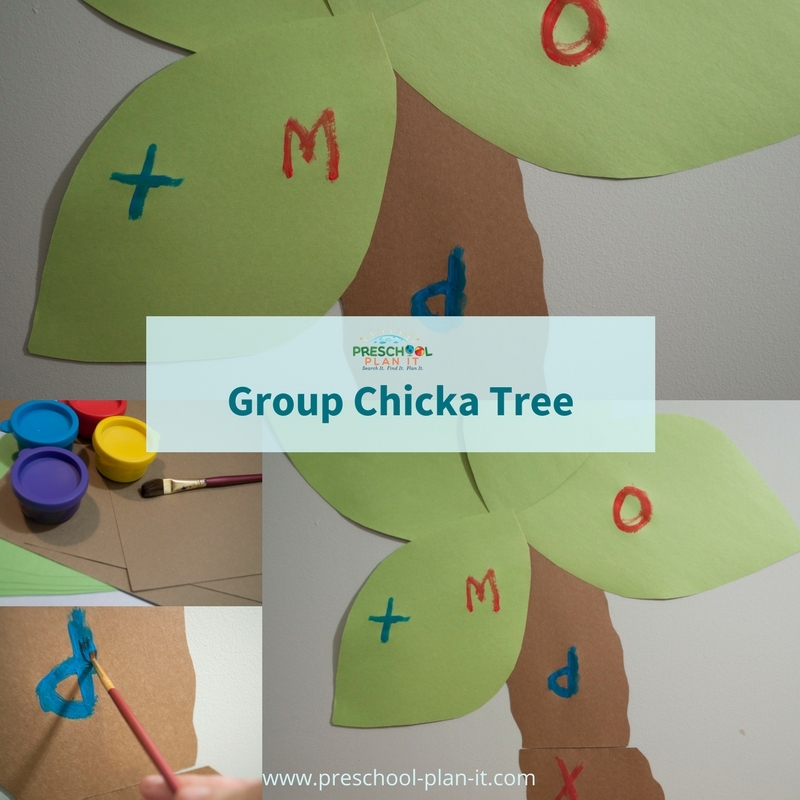 Chicka Chicka Boom Boom Theme Science Activities--for your Preschool Scientists in Training! 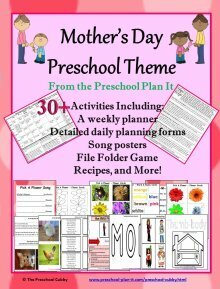 This one takes more prep time on your part but they are so adorable and the kids love them! You will find a picture of this on my Pinterest Page (see the link for Pinterest at the bottom of this page). 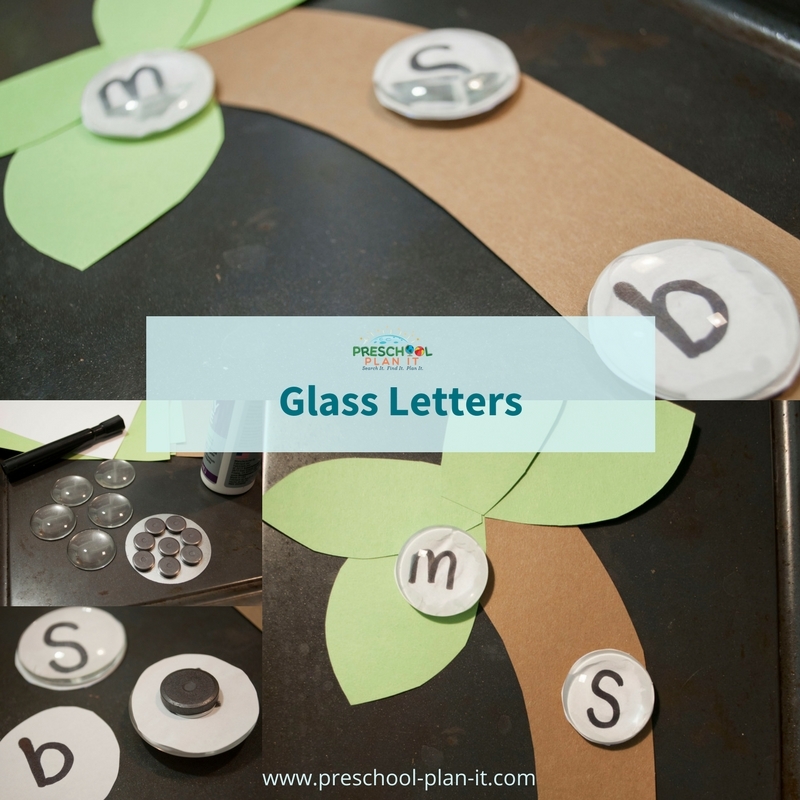 Materials needed: clear, plastic water bottles, skewer sticks (wooden), foam monkeys, foam or plastic letters, colored foil or more sturdy colorful material cut into leave shapes. Hot glue the stick into the cap. Hot glue the monkey onto the stick. Hot glue the leaves to the top of the stick. Add letters into bottle. Hot glue caps in place! These can also be purchased for $1.00 (USD) per shaker bottle by a woman, Sally Gilbert. I've never purchased them but heard they are great! Place coconuts in your science center for your children to explore. Include magnifying glasses, tape measures, balance scales and journals for your children to use as well. 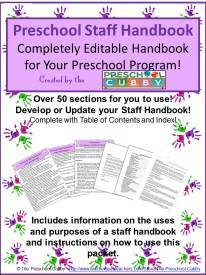 Writing Activity Ideas for Your Chicka Chicka Boom Boom Theme! Collect paper towel tubes. You will need at least one for each child. In advance, print the alphabet randomly on the tube. Print some in upper case and some in lower case. I would make specific tubes upper case and others all lower case. Mixing them up may be too frustrating for many preschoolers and they will not complete this activity. 26 letters is a lot! 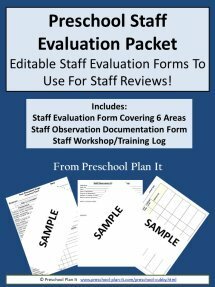 Give each child a sheet of letter stickers that have only one sticker of each letter. They then stick the sticker onto the matching letter on the tube!